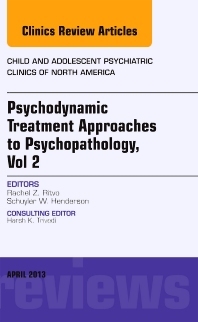 Psychodynamic Psychotherapy in Child and Adolescent Psychiatric Clinics covers topics in three major categories in two volumes of this series: 1. Approaches to Specific Conditions; 2. Special Features in Working with Children; 3. Research Presented for the Clinician. Specific conditions covered are: Anxiety, Trauma, Depression, Eating Disorders, Incipient Borderline Personality Disorders, and the Medically Ill Youth. Special Features include the various therapies in Psychodynamic psychotherapy: Play Techniques, Use of Boardgames, Perspectives on Psychotropic Medications for Children, Parent Work, Family Therapy, and Dyadic Therapies. Research for Clinicians includes Neuroscience, Evidence Base, and Developmental Perspectives.